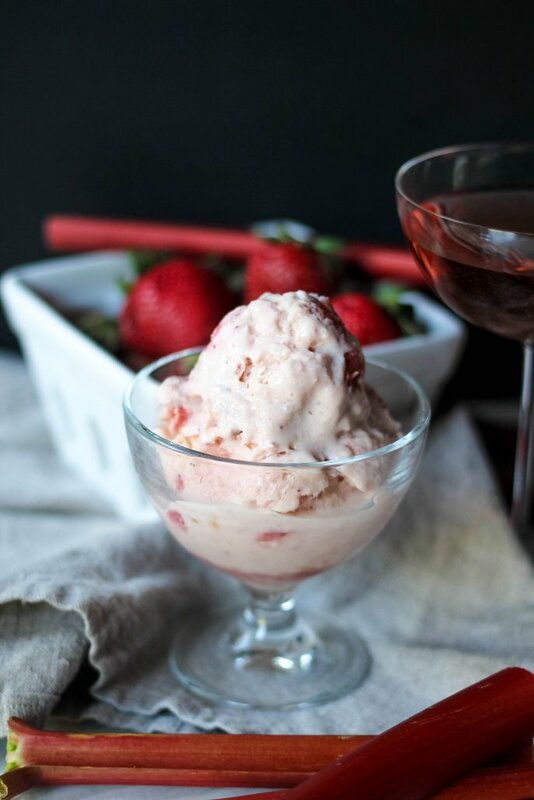 Today, I’m sharing this simply lovely recipe for Strawberry Rhubarb Ice Cream. 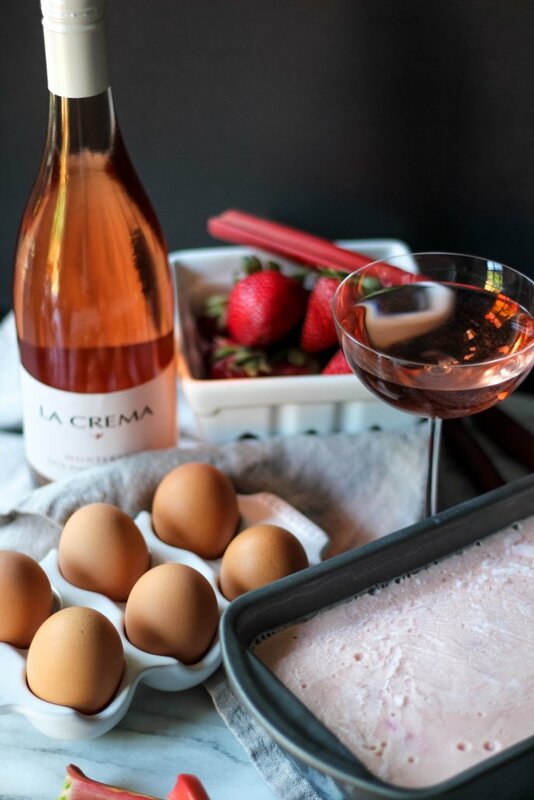 With Mother’s Day this weekend and rosé season in full swing, it’s absolutely the perfect dessert choice! One of the best parts of spring, for me at least, is definitely the abundance of strawberries. I was at my local farmer’s market the other day and there were gorgeous baskets of strawberries lined up at one stand, I couldn’t possibly resist buying one as a morning snack. Is there anything better than enjoying a sunny Sunday morning with a basket of warm strawberries in hand? I think the answer might actually be yes, and it involves fresh rhubarb and an ice cream maker. I love seeing rhubarb popping up everywhere this time of year. The way it balances the sweetness of strawberries is just divine, especially when combined into an ice cream. I made this version by combining cream, sugar and vanilla to create a luscious base, and then simmered chopped strawberries and rhubarb on the stove with a little more sugar until it cooked down into a gorgeous syrup. I love making ice cream because the ingredients are so simple: milk, sugar, eggs, and flavoring, in this case fruit (and a vegetable). The result is always so incredibly special. 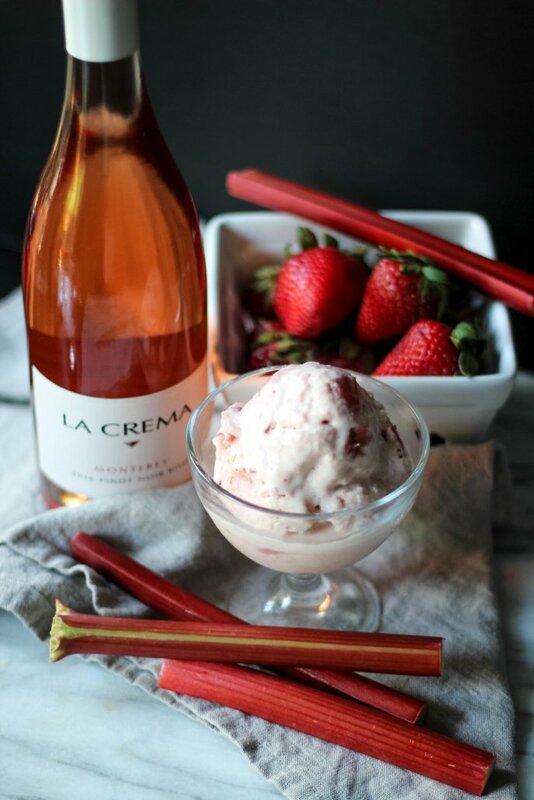 If you’re lucky enough to be near your mom (or other special women in your life) this Mother’s Day weekend, you should definitely whip up a batch of this strawberry rhubarb ice cream for her. 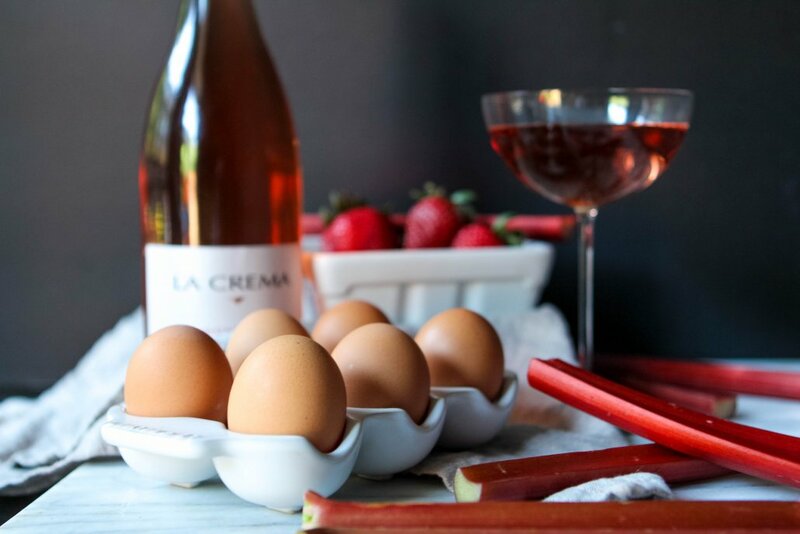 It pairs especially well with La Crema’s refreshing Monterey Pinot Noir Rosé, which has aromas of raspberry, strawberry, and mandarin orange. If you don’t have an ice cream maker, don’t worry, you can easily make the ice cream custard and mix it with the strawberry rhubarb sauce, then pour it into a dish and pop it in the freezer. Just make sure to give it a stir every 3-4 hours as it sets up. In a medium saucepan, bring the strawberries and rhubarb to a simmer over medium heat. Add the 1/2 cup of sugar and stir occasionally. Lower the heat to low and allow to cook down for 15-20 minutes, mashing slightly with a wooden spoon. (If you want chunks you can leave it slightly chunky, if you want it completely smooth you can use an immersion blender or mash even more with the spoon.) Turn the heat off and allow to cool on the stove. While the strawberry rhubarb mixture is cooling, mix the milk, cream and 3/4 of the cup of sugar together in another pot over medium heat. Bring the mixture to a boil and lower to a simmer. In a small bowl, mix the egg yolks and the remaining (1/4 cup) sugar. Add the cornstarch. Carefully take about a cup of the hot milk mixture and very slowly add it to the eggs to temper them. You want to do this super slowly and gradually so the eggs don’t scramble. Once you’ve added that bit of milk, pour the whole thing back into the pot and stir to combine over low heat. Continue to stir for 5-10 minutes, until the mixture thickens into a custard that coats the back of a spoon. Add the vanilla and remove from heat. Place the custard in an ice bath for about a half hour before combining it with the strawberry rhubarb mixture. Add the strawberry rhubarb custard mixture to your ice cream maker and mix according to manufacturer’s instructions. If you don’t have an ice cream maker, pour the mixture into a large baking dish and stir every few hours until set. Megan Flynn Peterson is a blogger and self-proclaimed foodie with dreams of a literary life. She has a master’s in Children’s Literature and an affinity for cultural studies, good food, great wine, bookstores, and those first few weeks of autumn. Her hobbies include running, cooking, taking photos, and blogging away at Freckled Italian. She currently resides in the San Francisco Bay Area with her husband, where she drinks coffee, writes personal essays, and tries to keep the house clean.